The phenomenon ‘intra-urban burial’ in Greek inﬂuenced Asia Minor can at first be grasped with the extraordinary Maussolleion at Halikarnassos. With this exception Maussollos formed his image in choosing by himself the site of his grave, a big part of the cult rites and the architecture, in which he joined Greek and oriental elements. The development of grave sites, cult rites and architecture forms for instance of the late classical graves of Termessos or Ephesos will be analysed in succession of Maussollos. During Hellenistic times euergetism played a big role inside micro-Asiatic cities, and the intra-urban grave was part of the honours from the polis to the benefactor. The special meaning of this cult place honoured a couple of centuries in the middle of a city can be recognized by detailed and copiousness inscriptions, for example of the burials of the euergetai at Kyme. During the time after establishing the Roman province Asia and during the Roman Empire in the East the intra-urban burial was anew a special honouring given by the polis, but the importance in relation to the creation of identity for the city changed. On the basis of a selection of intra-urban graves from the 1st and 2nd century AD the way how to deal with these burials within the poleis, their creation of identity of the city and the way of self-imaging of the deceased will be examined. I wish to thank Mr. Olivier Henry for inviting me to and for the splendid organization of the conference at the IFEA resp. Cezayir House. Also thanks to Anne Marie Carstens, Alexander Herda, Oliver Hülden, Martin Seyer and Martin Steskal for discussion. A special gratitude goes to Tina McGeorge, who read my article in a former version to prevent me from linguistic mistakes. This paper is going back to aspects of my doctoral thesis submitted 2000 in the Friedrich-Schiller-University of Jena, Germany, with the title “ΕΝΤΑΦΗ ΚΑΤΑ ΠΟΛΙΝ. Untersuchungen zum Phänomen der intraurbanen Bestattungen bei den Griechen”. 1In this research I wanted to examine all archaeological, epigraphical and literary sources of intraurban graves and burials within ancient Greek cities – exept for Lycia and Caria – from the end of the 8th century BC to the beginning of the 3rd century AD, which had come to my knowledge. Only graves and burials, which are archaeological excavated or written down in a literally or epigraphically source with a clear-cut testimony were collected, but not monuments of mythically heroes. – This article follows the regulations of l’Année philologique. 1 For the following basis information compare Schörner 2007a, 1-19 and 2007b, 134-144. 2At the end of the 8th century BC one can observe an interesting new phenomenon within the Greek colonized region1: a clear distinction between the city of the living (πόλις) and the city of the dead (νεκρόπολις) was customary for most of the following millennium. From that point in time, it is possible to recognize the beginning of the Greek polis, or city-state, as a uniform political, social and religious system. 3After that date, necropoleis at Greek cities are located close to but isolated from the settlement, first as a naturally evolving, unarranged group of graves, later in rows along the streets leading out of the city. The usual form of a burial there was the family grave, which could be visited by the family members of the deceased; it was the place for the cult of the beloved dead, securing the veneration and the remembrance of the deceased for a long time. But in early Archaic times, it is also noticeable that single interments or small groups of burials are placed intentionally within the city, first of all on the mainland Greece and afterwards all over the Greek inﬂuenced Mediterranean basin, for example very near of the West gate at Eretria on the island of Euboia, on the agora of Cyrene in North Africa or at the agora and close to the theatre of Mantineia on the Peloponnese2. ‘Intra-urban’ implies the area within a settlement built on with public, religious or private structures. In the period after Alexander the Great, the Greek inﬂuenced region was greatly extended, so – amongst others – two tombs near the city centre of Aï Khanoum in the ancient region of Bactria3, today located close to the border between Afighanistan and Uzbekistan, can also be included. 4In this contribution I want to examine the grave building at the agora of Termessos in Pisidia as a case study for burials within the city in late Classical and early Hellenistic time in ancient Anatolia. 5In Pisidia, within the city of Termessos, a quite unusual monument is located on the South side of the agora and in the West of the upper Gymnasium (fig. 1)5. It was mainly cut out of the same local limestone as the buildings of the whole city (figs. 2-3)6. The traces of the moil chisel can be seen all over the monument and also inside the three niches on the West side (fig. 5). A ﬂight of steps leads from the North to a platform, which is covered with ﬂat limestone slabs and limited on the South with a semi-circled bench (fig. 4). Behind it the cut rock towers up, and in the middle of it lies the area for the funeral, East-West oriented, a cassa perfectly hollowed in the rock (figs. 2-3). The round shaped lid – the outer side convex, the inner concave – has fallen down to the South of the monument, broken into two pieces. If there had ever existed an architectural ornamentation it is not preserved7. 6No grave or votive oﬀerings are preserved, although it is clear, that the three niches in the West wall were made for the deposition of objects of veneration (fig. 5). Also platform and bench had certainly served for congregations, cultic activities and remembrance of the deceased person (fig. 4). On the left side of the niches, a small canal can be seen. It begins within a little basin, is deﬂected downwards towards the ground, but the end is hard to see because of the vegetation (figs. 5-6). This was certainly a construction for liquid oﬀerings (libations). Thoas, son of Kendeas, grandson of Obrimotes. 9 Zgusta 1964, § 432 (Thoas). § 576-1 (Kendeas). § 1069-7 (Obrimotes). 8The style of writing is unequal, not upon one line. Theta is the biggest letter with a height of 30 cm, the other letters are about 18 cm high, which makes an emphasizing of Thoas most likely. Unfortunately, one Thoas, son of Kendeas and grandson of Obrimotes remains unknown until today9. Rudolf Heberdey and George E. Bean read ‘Thoas and Obrimotes, sons of Kendeas’10, but it is implausible because of the writing direction from left to right and because there is sole one cassa only for one deceased person at the peak of the monument. 11 For this problem: Gorissen 1978, 149-163. 13 Arr. an. I 27, 5-28, 2. 9The dating of the inscription is problematic. The letters with the round shapes are not very helpful11, nor the fact that Greek inscriptions prior to the 2nd century BC are unknown to us at Termessos12. 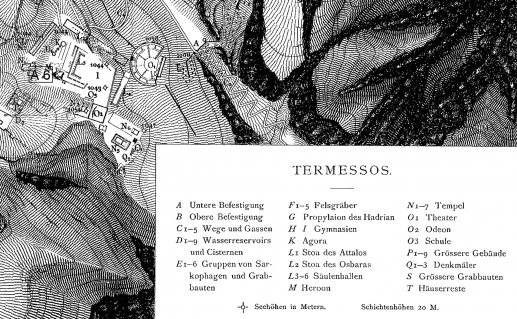 We know from Arrianus13, that Termessos did exist in 333 BC, because Alexander wanted to seize it, but was unable to do so. The levelling of the agora plateau must belong to the early works of the building project after founding of the settlement because it is not conceivable that such a great block of rock was standing crude for decades or for centuries at one side of the agora. Taking all this into consideration, the unfortunately inadequate published grave at Termessos must belong to the late Classical or early Hellenistic era. 10The location of that tomb within the agora follows most likely Greek, and not Anatolian prototypes for an honoured grave of a very important person of a city14. The oldest example for that site is the grave of Heropythos at the agora of Ephesos about 340 BC15. 17 Marzolﬀ 1986, 83-84 drawing 3; fig. 5; 3rd-2nd cent. BC, now destroyed. 11Rock-cut tombs possess a very long, several millennia long lasting tradition in Anatolia. On first sight the tomb on the agora of Termessos in Pisidia looks very unusual, because it doesn’t belong to the most common group of the rock-cut façade graves. The architecture, the elements mostly cut out of the rock but some also build up with slabs, seemed to be an Anatolian tradition. Most narrow comparisons one can find in the necropoleis of South-Western Anatolia, with steps leading to a platform, like at the Kaineus grave at Limyra16. A platform which forms the place for the veneration before the cassa or sarcophagus is very seldom, one example occurs at Demetrias in Thessalia17. 20 Yılmaz 2007, 155-204 esp. 176-177 fig. 15. 21 Prayon 2008, 1035-1044 figs. 1-16. 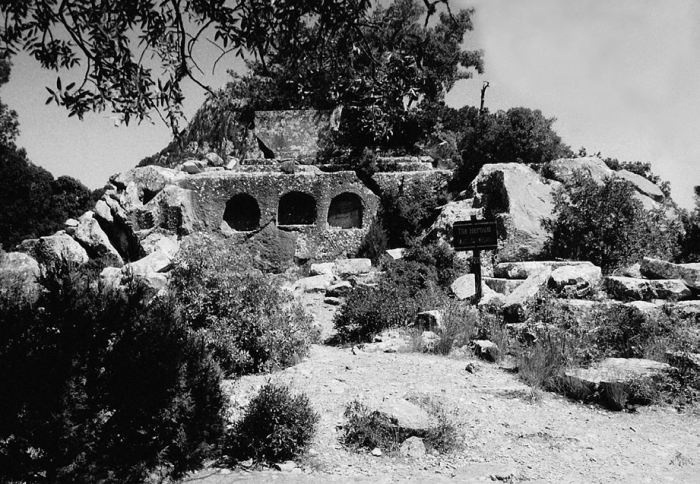 12The place of the sepulture at Termessos, the cassa, looks like a ‘chamosorion’ on the top of the edifce. Chamosoria are not uncommon in South-West Asia Minor, for instance they occur in several necropoleis in Caria18 or Pisidia19. 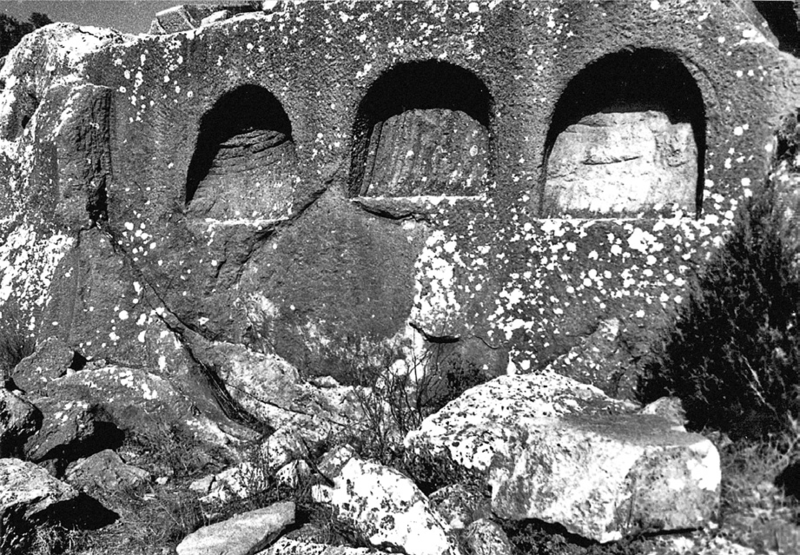 For a cassa deepened in the highest point there are far fewer examples: A rock-cut sarcophagus in the North necropolis at Melli in Pisidia20, but secluded from the main cemetery was founded on the highest point of a rock, surrounded by a bench, perhaps for congregations. From the position of the tomb there is an excellent view over the city of Melli. At Beşkardeş in Cappadocia a rock-cut tomb possesses shape and ornament of a garland sarcophagus21. On a free standing block of stone one can see that it is executed on one broadside as a garland sarcophagus, with two pilasters on the edges, one bucranium in the middle and two bows of garlands; beneath there are three niches like at Termessos, although the niches at Beşkardeş are smaller as in Termessos. On the other side, steps are leading up to the top. On that place the cassa for the burial was hollowed out; the lid is not preserved, but the traces of folds on the edge can be seen. Both rock-cut sarcophagi are younger than the example on the agora of Termessos and date into Roman Imperial Times, the 2nd or 3rd cent. AD. 22 Fleischer 2008, 197-242 (“Gipfelheiligtum”). 23 Common to the topic of libation: Schörner 2007a, 163-164. 13At Termessos the rock-cut canal or drain (figs. 5-6), which begins within a little basin under the niches is surely a construction for liquid oﬀerings, for libations. 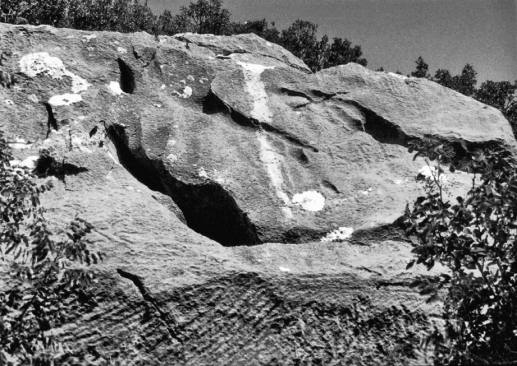 Robert Fleischer discovered a comparable cavity at a rock sanctuary, NorthWest of the city; he named it ‘sanctuary of the peak’22. It consists of one niche with the picture of an unidentified god and of a basin in front of it. A canal does not exist. The reason may be that the oﬀering for an Olympic god ought to ﬂow down into a basin, where it remains. The liquid oﬀering for the hero at the agora, however, should be conducted into the ground to ‘feed’ the hero23. This group of sanctuaries also belong to the Roman Imperial Times because of the inscriptions there, but the origin might be older. An analogy for libation at a Hellenistic intra-urban grave presents the sarcophagus no. 3 within the Heroon of Kineas at Aï Khanoum, where a hole in the lid and a canal from the ﬂoor of the chamber to that lid confirms that kind of cultic veneration24. 25 According to Cicero, the liberation is equivalent to the founding of a city: Cic. rep. I 7. 26 And for a long time inhumation and cremation at the same time: Köse 2005, 81-83. 107-109. 28 İplikçioğlu 1999, 309 note 2 with the older evidences; Waelkens 2004, 441. 14Greek inﬂuence is visible chieﬂy on the inscription in Greek letters. The person Thoas, son of Kendeas and grandson of Obrimotes, had achieved during his lifetime something brilliant we do not know. Maybe he was a κτίστης, the founder, or a νέος κτίστης, a liberator or re-founder25 of his home town Termessos, possibly at the siege of the army of Alexander in 333 BC. Whatever the case his achievement provided him this great tomb on the agora of Termessos with the permission of the inhabitants. Unfortunately many questions in reference to the date of that monumental grave remain open, because of the lack of ornamentation, the unclear evidence of the shapes of the letters, or the fact that inhumation into a sarcophagus was practiced through the centuries in Hellenistic and Roman Times26. Both a Pisidian (Obrimotes)27 and a Greek (Thoas) personal name are mentioned in the inscription. At first time the name ΟΒΡΙΜΟΤΕΣ is mentioned in an inscription found in the area of the town, which can be dated in the year 278 BC, when the city was under the rule of the Ptolemaioi28. Unfortunately this inscription is totally diﬀerent from the one hewn into the Heroon and the letters are very small, so it cannot give us a chronological comparison. 34 Like the Hellenistic Heroon I at Miletus: Schörner 2007a, 237-238 Cat. A 16 figs. 86-94. 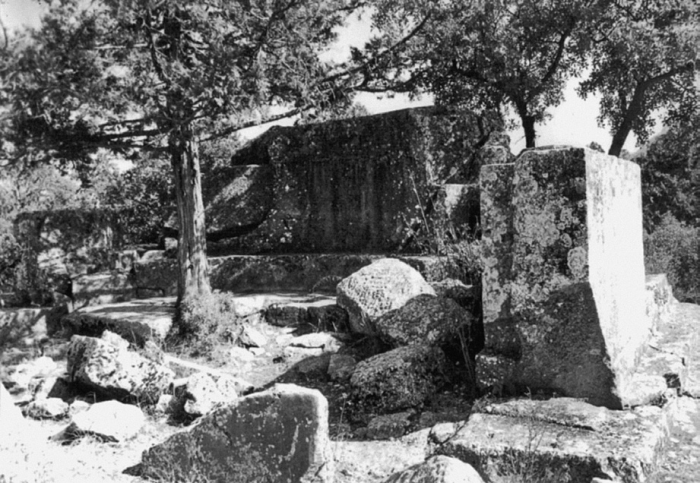 35 Like the late-Classical tomb in Kassope, Epirus: Schörner 2007a, 222-223 Cat. A 7 figs. 37-41. 39 Schörner 2007a, 240-242 Cat. A 18 figs. 102-110. 40 Schörner 2007a, 242-243 Cat. A 19 figs. 111-115. 15With regard to the burial place within the city, there does not exist a great diﬀerence between the examples from mainland Greece and those from the late classical Asia Minor and later29. In both cases the agora30 or another great square31 were the appreciate places for the intra-urban tomb, respectively along an important street32 and also at vulnerable points of the polis, such as gates33. The architectural form both in Asia Minor and in Mainland Greece is more extensive in comparison to extra-urban graves: tumulus (with an architectural frame) with the grave chamber within34 or under it35, or a common grave house36. In late Classical times the grave building can possess an architectural connection with a building of another function, mostly a Gymnasium37, in Roman Imperial times also a library38. Rarely, and only in Asia Minor, two storeyed grave buildings appear, after the Maussolleion the two octagons at Ephesos39 and Aphrodisias40 from Augustan times. One can observe a strong dependence of the conspicuous graves on local style. 41 Schörner 2007a, 213-216 Cat. A 3 figs. 15-23. 16The reason for allowing the tomb within the polis is very broad and changed during the centuries: First of all the burial place on the agora was reserved for the κτἱστης, the founder of the polis, as maybe the case of the unknown deceased in the agora in Termessos. A Greek colony normally performed periodically their rituals both in the sanctuary of the urban Olympic god and at the tomb of the founder as a deep expression of their common identity. The best example of that is Kyrene in North Africa, where the grave of the founder and king Battos41 lies not far away from the temple of Apollon. Besides that other personalities could be honoured for their lifetime achievement, such as winners of Olympic Games42, authors43, statesmen44 or generals45. At Hellenistic times, the role of benefactors, εὐεργέται, grew in an intense way46 until about 200 AD47. 48 Plut. Lyk. 27, 1. 49 For that topic compare Schörner 2007a, 203-205. 17There does not exist any Greek written source prohibiting burials within the cities. Only for early Archaic Sparta the legislator Lykurgos had allowed it, as Plutarch reports48. The reason, he tells us, was that the youth should get accustomed to the sight of burials, because death is not a “Miasma” for these who had touched a dead body or had walked over graves. Miasma in this connection means pollution in a figurative sense49. 18The Greek intra-urban grave as phenomenon existed on mainland Greece from 720 BC onwards with the formation of the Greek polis. In Asia Minor the oldest grave within the city – except the Maussolleion at Halicarnassus – is indicated with the Pisidian tomb on the agora at Termessos. 50 Waelkens 2004, 467; Doni 2009, 216-219. 51 With Greek legends: Waelkens 2004, 453. 19The Pisidians – non-Greek people of Anatolian origin – had practiced since the 4th cent. BC a kind of Self-Hellenization50. Already under the reign of Antigonos Monophthalmos, in the years after 319 BC, the Termessians minted their own coins51. 20It is conceivable without problems that they assumed also this Greek phenomenon of honouring a prominent citizen with the great privilege of the burial at the city centre. It is quite possible that this citizen was the founder of Termessos and his grave belongs to the second half of the 4th cent. or the beginning of the 3rd cent. BC52. But last certainty can give us only new researches, or excavations within the city of Termessos, or finds of new inscriptions. Bean, G.E. 1991, Kleinasien II: Die türkische Südküste von Antalya bis Alanya, Stuttgart, 1991³. 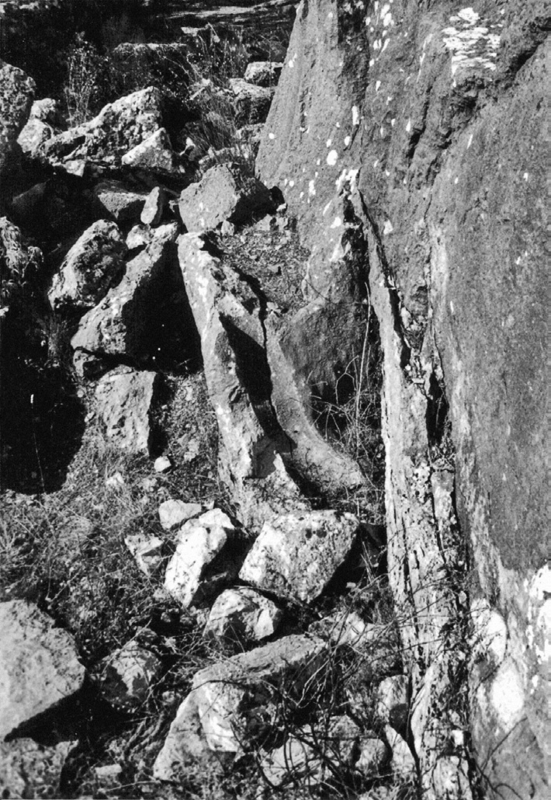 Bernard, P. 1975, “Campagne des Fouilles 1974 à Aï Khanoum”, CRAI 1975, 180-189. Blandin, B. 2010, “Die Gräber des Heroon”, in Ch. Martin-Pruvot / K. Reber / T. Theurillat (éds. ), Ausgegraben. Schweizer Archäologen erforschen die griechische Stadt Eretria. Eine Ausstellung der Schweizerischen Archäologischen Schule in Griechenland in Zusammenarbeit mit dem Antikenmuseum Basel und Sammlung Ludwig, Bâle, 2010, 263-265. Çelgin, A.V. 1994, “Termessos ve çevresinde nekropol ve epigrafya araştırmaları: 1975-1991 yılları arasında yapılan calışmaların toplu sonuçlarına kısa bir bakış”, Anadolu Araştırmaları 13, 1994, 153-177. Çelgin, A.V. 1997, “Termessos Gymnasionları: Yazıtların Işığında Bazı Gözlem ve Değerlendirmeler”, Arkeoloji Dergisi 5, 1997, 111-144. Doni, C. 2009, “The Pisidians: From Their Origin to Their Western Expansion”, in H. Bru / F. Kirbihler / S. Lebreton (éds. ), L’Asie Mineure dans l’Antiquité. Échanges, populations et territoires, Actes du colloque international de Tour 2005, Rennes, 2009, 213-227. Fleischer, R. 2008, “Unbekannte Felsheiligtümer in Termessos”, MDAI(I) 58, 2008, 197-242. Fougères, G. 1890, “Fouilles de Mantinée (1887-1888) II : Topographie intérieure”, BCH 14, 1890, 245-275. Gorissen, R. 1978, “Litterae lunatae”, AncSoc 9, 1978, 149-163. Heberdey, R. 1934, “Termessos No. 2”, in Pauly-Wissowas Realencyclopädie II. 9, Stuttgart, 1934, 732-775. Heberdey, R. 1941, Tituli Pisidiae [Tituli Asia Minoris III.1], Vindobonae, 1941. Henry 2009 Henry, O., Tombes de Carie. Architecture funéraire et culture carienne, VIe-IIe s. av. J.-C., Rennes, 2009. İplikçioğlu, B. 1993, “Epigraphische Forschungen im antiken Termessos und seinem Territorium”, in G. Dobesch / G. Rehrenböck (éds. ), Hundert Jahre Kleinasiatische Kommission der österreichischen Akademie der Wissenschaften, Akten des Symposiums von 23. bis 25. Oktober 1990 [14. Ergänzungsbd. TAM], Vienne, 1993, 255-263. İplikçioğlu, B. 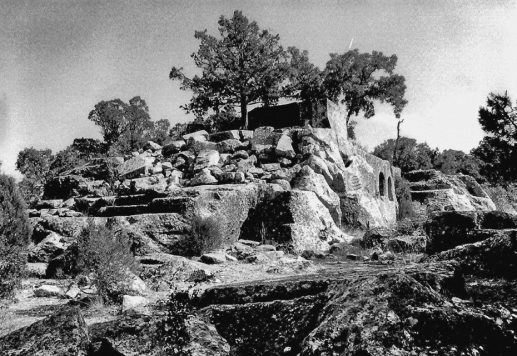 1999, “Zum Territorium von Termessos in Pisidien”, in P. Scherrer / H. Täuber / H. Thür (éds. ), Steine und Wege, Festschrift für Dieter Knibbe zum 65. Geburtstag [Sonderschriften ÖAI 32], Vienne, 1999, 309-314. Kenzler, U. 1999, Studien zur Entwicklung und Struktur der griechischen Agora in archaischer und klassischer Zeit, Frankfort / Vienne, 1999. Köse, V. 2005, Nekropolen und Grabdenkmäler von Sagalassos in Pisidien in hellenistischer und römischer Zeit [Studies in Eastern Mediterranean Archaeology 7], Turnhout, 2005. Kuban, Z. 2012, Die Nekropolen von Limyra. 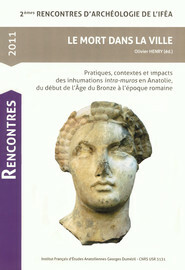 Bauhistorische Studien zur klassischen Epoche [Forschungen in Limyra 4], Vienne, 2012. Lanckoronski, K.G. 1892, Pisidien [Städte Pamphyliens und Pisidiens II], Vienne, 1892. Marzolﬀ, D. 1986, “Grabbauten von Demetrias”, in K. Braun / A. Furtwängler (éds. ), Studien zur Klassischen Archäologie. Friedrich Hiller zu seinem 60. Geburtstag, Sarrebruck, 1986, 73-90. Mitchell, S. 1994, “Termessos, King Amyntas, and the War with the Sandaliôtai. A new inscription from Pisidia”, in D. French, (éd. ), Studies in the History and Topography of Lycia and Pisidia. In Memoriam A. S. Hall, Ankara, 1994, 95-105. Pekridou, A. 1986, Das Alketas-Grab in Termessos [Istanbuler Mitteilungen Beiheft 32], Tübingen, 1986. Prayon, F. 2008, “Ein Felsdenkmal in Kappadokien”, in I. Delemen (éd. ), Euergetes. Festschrift für Prof. Dr. Haluk Abbasoğlu zum 65. Geburtstag, Antalya, 2008, 1035-1044. 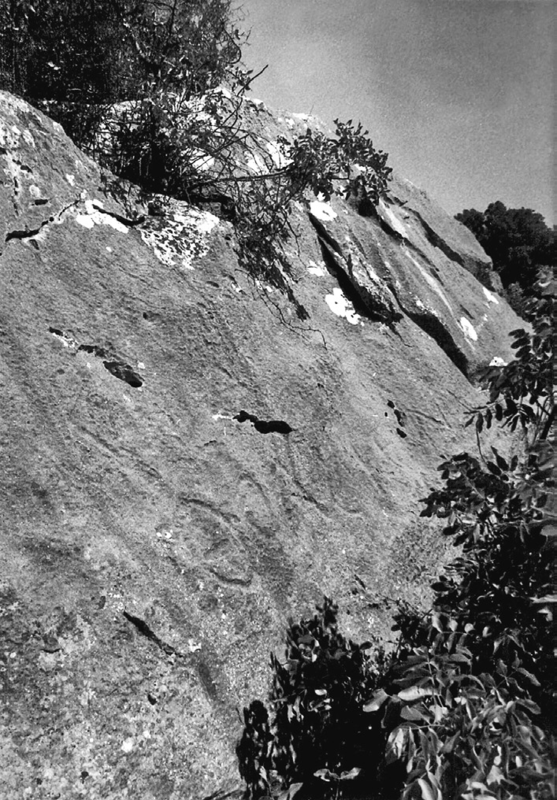 Robert, L. 1973, “Les inscriptions”, in P. Bernard (éd. ), Fouilles d’Aï Khanoum I 1, Paris, 1973, 211-237. Schörner, H. 2005, “Grabarchitektur, Ausstattung und Beigaben als Indikatoren der Romanisierung/Romanisation in der Römischen Provinz Asia am Beispiel des Grabbaues am Theater in Priene”, in G. Schörner (éd. ), Romanisierung - Romanisation. Theoretische Modelle und praktische Fallbeispiele [BAR Int. Ser. 1427], Oxford, 2005, 219-234. Schörner, H. 2007a, Sepulturae graecae intra urbem. Untersuchungen zum Phänomen der intraurbanen Bestattungen bei den Griechen [9. Beiheft Boreas], Möhnesee, 2007. Schörner, H. 2007b, “Die griechische intraurbane Bestattung: eine identitätsstiftende Ausnahme von der Regel?”, in R. Sörries (éd. ), Creating Identities. Die Funktion von Grabmalen und öﬀentlichen Denkmalen in Gruppenbildungsprozessen, Internationale Fachtagung Kassel 2003 [Kasseler Studien zur Sepulkralkultur 11], Norderstedt, 2007, 134-144. Waelkens, M. 2004, “Ein Blick in die Ferne. Seleukiden und Attaliden in Pisidien”, MDAI(I) 54, 2004, 435-471. Yılmaz, N. 2007, “Necropoleis and Funerary Monuments in Pisidia During the Roman Period”, Adalya 10, 2007, 155-204. Zgusta, L. 1964, Kleinasiatische Personennamen, Prague, 1964. 2 For the examples: Eretria (Euboia), burials under the triangulum east of the West gate: Schörner 2007a, 209-212 Cat. A 1 figs. 1-8; Blandin 2010, 263-265. Kyrene (North Africa), burial of king Battos at the agora: Schörner 2007a, 213-216 Cat. A 3 figs. 15-23; Kenzler 1999, 171-172. 191-192. Mantineia (Arcadia), burial of Podares at the agora: Schörner 2007a, 216-218 Cat. A 4 figs. 14-27; Fougères 1890, 255-256 pl. I. XVII. 3 Aï Khanoum, so called Heroon of Kineas: Schörner 2007a, 227-228 Cat. A 10 figs. 51-60; Robert 1973, 211-237. I 2 pl. 108 (inscription). Aï Khanoum, Mausolée: Schörner 2007a, 229-230 Cat. A 11 figs. 51. 61-64; Bernard 1975, 180-189 figs. 9-15. 4 Schörner 2007a, 220-222 Cat. A 6 figs. 34-36 for the earlier references and the detailed measurements. A sufcient description and adequate publication of that grave building unfortunately doesn’t exist so far. But compare for the older researches Çelgin 1994, 160. For the history of researches see İplikçioğlu 1993, 255-256. 5 For site and localisation: Lanckoronski 1892, plan after p. 20. The earliest known building on the agora is the Stoa of Attalos II, demonstrated by an inscription: Lanckoronski 1892, plan after p. 20, here fig. 1 (L 1). 38-39. 6 Heberdey 1934, 735-736 fig. 1 (map of the city, M: grave at the agora); Lanckoronski 1892, 36-37. - Date of the visit of the author at Termessos: 08-23-2002, at that time the photographs were produced. 7 Lanckoronski (1892, 37) mentioned pieces of Ionian ornamentation around the three niches on the West side, but nothing of it can be seen today. 8 Heberdey 1941, Nr. 874 (drawing of the inscription). He begins with ΚΑ[ΤΕΧΕΙ] with KΑ above the Α of ΘΟΑΣ. 10 Heberdey 1941, Nr. 874. Bean 1991, 117 believed that the inscription belongs to two “Gräbern unten im Felsen”, but on location nothing is visible. Lanckoronski 1892, 36-37 is uncertain whether the inscription belongs to the burial originally laid down in the cassa. 14 Compare the late-Classical grave for Podares on the agora at Mantineia, Arcadia (Peloponnesos): Schörner 2007a, 216-218 Cat. A 4 figs. 14-27. For the phenomenon: Schörner 2007a, 20-37 esp. 24. 15 Arr. an. I 17, 11. Compare for that only literally received burial Schörner 2007a, 266-267 Cat. B 11. 16 Kuban 2012, 271-272 necropolis III, grave no. 6 (partly cut out of the rock, partly built up); it dates also in late Classical or early Hellenistic times. 18 Henry 2009, 35 figs. 3-4 pl. II A: ‘sarcophage rupestre’ at Labraunda, and many more within the same volume. 19 To chamosoria in Pisidia in Hellenistic times: Köse 2005, 101, for chamosoria in Pisidia in Roman times: Yılmaz 2007, 176-177. To chamosoria in general compare Schörner 2007a, 89-90 note 737. 24 For the Heroon of Kineas compare Schörner 2007a, 131. 227-228 Cat. A 10 figs. 52. 55. 58 (sarcophagus no. 3). 27 The name “Obrimotes” was common in Hellenistic times: compare Çelgin 1997, 116 (inscription from the Gymnasium at the Agora of Termessos), or Mitchell 1994, 95-96 (inscription from the Pisidian chora, 1st cent. BC). 29 For the following compare the interpretation for the aspects of the chosen localisation, architecture and equipment of the intraurban grave, and also for the deceased and honoured person in Schörner 2007a, passim. 30 Like the Archaic burial of Glaukos at the agora of Thasos: Schörner 2007a, 212-213 Cat. A 2 figs. 9-14. 31 Like the late-Classical burial of Dion upon an eminent place of Syrakus, Sicily: Schörner 2007a, 266 Cat. B 10. 32 Like the Hellenistic burial(s) under the Mosaic house at Eretria, Euboia: Schörner 2007a, 238-240 Cat. A 17 figs. 95-101. 33 Like the Archaic burials under the triangulum near of the West gate at Eretria, Euboia: Schörner 2007a, 209-212 Cat. A 1 figs. 1-8. 36 Like the late-Classical grave for Podares on the agora at Mantineia, Arcadia: Schörner 2007a, 216-218 Cat. A 4 figs. 14-27. 37 Like the late-Hellenistic burials at the Gymnasium at Messene: Schörner 2007a, 245-247 Cat. A 21 figs. 121-125. 38 . Like the Celsus library at Ephesos with the burial of C. Iulius Celsus within a chamber in the basement: Schörner 2007a, 250-252 Cat. A 24 figs. 140-143, or the burials of wife and son of Dion of Prusa in a court belonging to a library at Prusa, Bithynia: Schörner 2007a, 286-287 Cat. B 27; Plin. ep. X 81, 1-8. 42 Antenor, son of Xenares, won the pancratium at Olympia in 308 BC (118. Olympiad): Schörner 2007a, 271-272 Cat. B 15. 43 Aristias, son of Pratinas, author of satyr’s plays, won the 2nd price at a dramatic contest in 467 BC: Schörner 2007a, 263 Cat. B 5. 44 The Peloponnesian politician Philopoimen, son of Kraugis, was honoured with an intraurban burial at Megalopolis, Arcadia: Schörner 2007a, 274 Cat. B 17 fig. 175. 45 The commander Brasidas, son of Tellis, from Sparta, died at the battle of Amphipolis in 422 BC: Schörner 2007a, 264-265 Cat. B 8. 46 One of the earliest examples, dating in the 3rd quarter of the 2nd cent. BC, is Archippe, daughter of Dikaiogenes. For that benefactress, who has spent a lot of money for her hometown Kyme, see above and Schörner 2007a, 276-277 Cat. B 19 fig. 177. 47 The author chose this point in time, because the latest example for non-christian intraurban burials is illustrated by the Heroon III at Miletus: Schörner 2007a, 258-259 Cat. A 29 figs. 86. 168-173. 52 Most interesting is the contrast of the agora-grave and the so called grave of Alketas, who wasn’t citizen of Termessos, but died there and was also honoured with a prominent grave in one of the necropoleis of Termessos: Pekridou 1986. SCHÖRNER, Hadwiga. The Intra-Urban Burial inside Greek Poleis in Asia Minor : The example of Termessos In : Le Mort dans la ville : Pratiques, contextes et impacts des inhumations intra-muros en Anatolie, du début de l'Age du Bronze à l'époque romaine [en ligne]. Istanbul : Institut français d’études anatoliennes, 2013 (généré le 20 avril 2019). Disponible sur Internet : <http://books.openedition.org/ifeagd/2429>. ISBN : 9782362450556. DOI : 10.4000/books.ifeagd.2429. Schörner, Hadwiga. “The Intra-Urban Burial inside Greek Poleis in Asia Minor : The example of Termessos”. Henry, Olivier. Le Mort dans la ville : Pratiques, contextes et impacts des inhumations intra-muros en Anatolie, du début de l'Age du Bronze à l'époque romaine. Istanbul : Institut français d’études anatoliennes, 2013. (pp. 223-230) Web. <http://books.openedition.org/ifeagd/2429>. HENRY, Olivier (dir.). Le Mort dans la ville : Pratiques, contextes et impacts des inhumations intra-muros en Anatolie, du début de l'Age du Bronze à l'époque romaine. Nouvelle édition [en ligne]. Istanbul : Institut français d’études anatoliennes, 2013 (généré le 20 avril 2019). Disponible sur Internet : <http://books.openedition.org/ifeagd/2057>. ISBN : 9782362450556. DOI : 10.4000/books.ifeagd.2057.